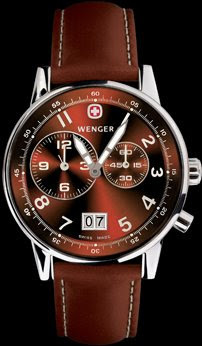 "A popular Wenger stalwart, our Commando series of Swiss watches combines outstanding form with diverse functionality. Obviously, it's no coincidence that those are also traits commonly associated with the legendary inspiration for all of our products, the genuine Swiss Army knife. These watches are equally suited for the field or the office, at day or night, like all good commandos they adapt to their environment naturally with quiet confidence. The Commando Dual Time 2-Eye 74714 features a brown dial with brown subdials and brown leather strap."